Mission Statement: STEPS provides homeless clients with the tools necessary to become self-sufficient. Clients are provided with transitional shelter and taught the skills necessary to seek, obtain, and maintain employment. STEPS prepares each client with the knowledge required for success in independent living. Clients may remain in the program up to one year. Opening in in 1990, the 40-bed STEPS program in San Diego provides a comprehensive employment/transitional living program for homeless men. Clients must be alcohol and drug-free and be willing to work full-time. Services include one-on-one case management; job preparation with accompanying workshops; employment counseling involving interest and aptitude testing, screening, case planning, budgeting, career development, and weekly follow-up. Once employed clients are trained regarding employment retention and active job development. Year after year, within weeks of arriving at STEPS, nearly 70% of men find full-time jobs. Over 80% of men save enough money to successfully move into permanent housing. "God has a purpose for me"
After two prison terms, a lifetime of violence, alcohol abuse, and selling drugs, Michael was ready to change. A friend suggested he get help at The Salvation Army's STEPS program, and when he enrolled, Michael's life changed, although Michael admits that it hasn't been easy. 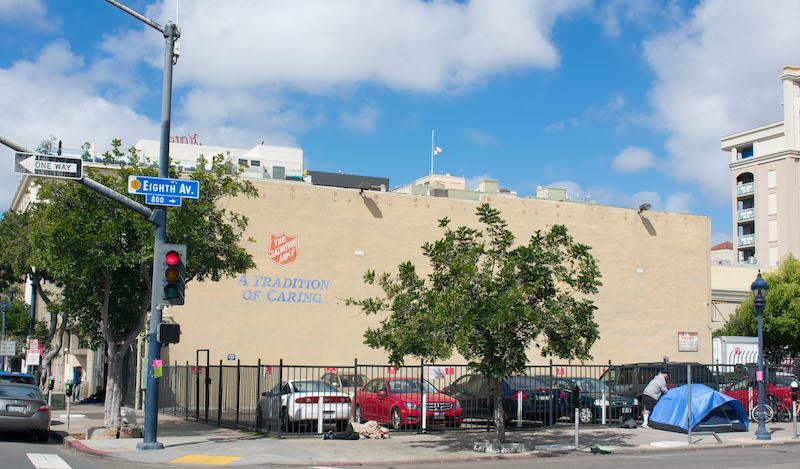 "The Salvation Army is a good place for people that want help. The way that the program is structured to get you the stability, to give you the tools that you need to get back on your feet is amazing. We need programs like this." The initial difficulties of re-entering the workforce are addressed. Develop a working relationship with the STEPS staff. Working through the frustrations of looking for gainful employment. An office/phone room is provided to assist with seeking full time employment. Facility: Shared rooms, shower facilities, dormitory space, common bathrooms, kitchen. Meals: A kitchen is provided for clients to make their own meals. No meals provided. Program Rules: Client must help with chores, must be clean from all substances, no smoking, prescription medication must be given and distributed by shelter staff. Stay Length: Program duration for an average successful client is 4 to 9 months. Clients can stay up to one year as long as they are actively participating in the program and making progress towards self-sufficiency. Applicants attend an orientation, which is offered every Monday at 8:30 a.m. Applicants will then be interviewed/assessed. The list of accepted applicants will be posted at 4:30 p.m. the same afternoon. Accepted clients then move into the STEPS Facility for the duration of the time in the Program.